In August 2016, Hermann Elger was named the General Manager of Baccarat Hotel New York and Chief Operating Officer of Baccarat Hotels and Resorts. In this role, he oversees the day to day operation of the flagship hotel and plays a leadership role in the development of new hotels opened under the Baccarat Hotel brand in the future. A well respected leader in the luxury hospitality arena for over 25 years, Elger was previously the General Manager of The St. Regis New York and General Manager at the Montage, Beverly Hills. Before this, Elger was with The Ritz-Carlton Hotel Company for nearly 18 years. In addition to serving as Hotel Manager and then General Manager for The Ritz-Carlton, Cancun, Elger was Hotel Manager at The Ritz-Carlton, Key Biscayne. He played an integral role in the development of new hotels as Opening Team Leader for The Ritz-Carlton, Aspen Highlands, Philadelphia, Dubai and Kuala Lumpur. A native of Mexico City, Elger attended the University of Denver, where he received his B.S.B.A. in Business Administration and Hotel Management. From his humble beginnings as a Doorman for The Brown Hotel in Denver, Colorado, this second-generation hotelier has established himself as an accomplished and innovative leader in luxury hospitality. He was named Best GM in US and Canada at the 2016 Travvy awards, and American Express Fine Hotels and Resorts most innovative GM for 2016. 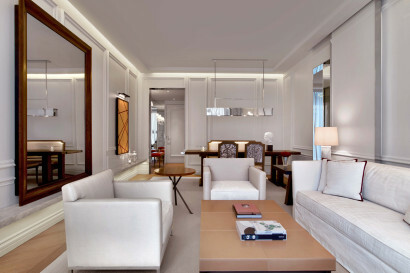 Baccarat Hotel New York is the first of its kind, translating 250 years of French craftmanship and legacy in to this groundbreaking hotel experience. This is considered the ‘flagship’ property and the prototype for the brand. 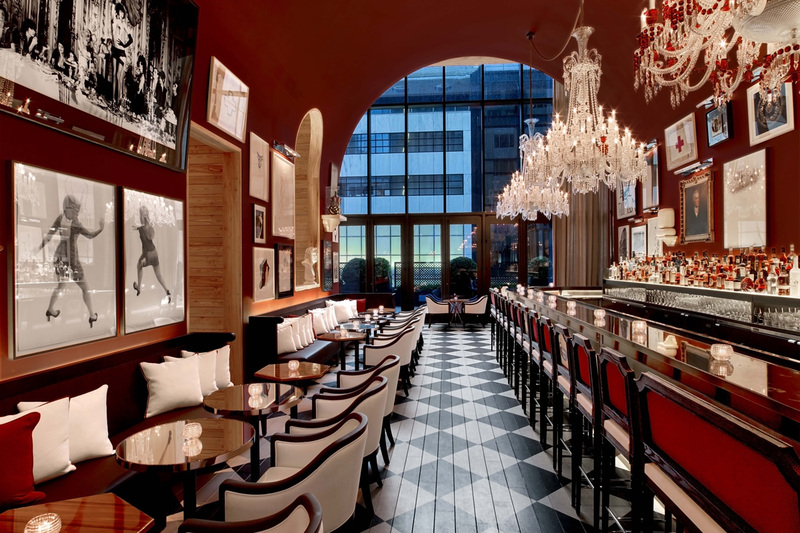 Baccarat Hotel projects are in development in Doha, Dubai and Rabat. 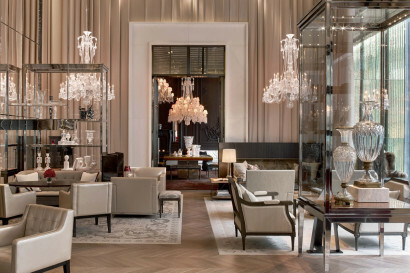 Founded by King Louis XV in 1764, Baccarat is a legendary French crystal company whose artisans have been producing objects of perfect craftsmanship for over 250 years. Baccarat has long been the embodiment of the fine art of living for kings and queens, sultans and tsars, moguls and rock stars and entwined with the most exquisite celebrations. Today, its evolution from luxury product to luxury hotel translates the brand’s unique artisanal essence into a living breathing culture of craft. Baccarat Hotel New York delights guests and residents by combining the noble heritage of Baccarat with elements of unexpected magic. Newly constructed and established in March 2015 designed by Gilles & Boissier, curated designers out of Paris. Upon arrival, guests are greeted by one of our dedicated hosts and treated to complimentary Champagne and light fare in the Petit Salon. 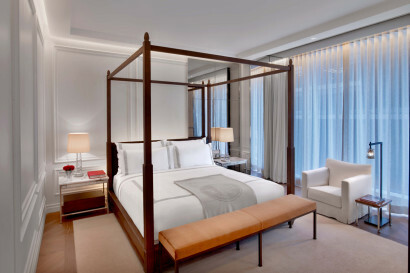 Located in the heart of Midtown, just west of Fifth Avenue, Baccarat Hotel New York is a stone’s throw from Rockefeller Center, couture shopping, Broadway and Central Park. It resides directly across from the sophisticated Museum of Modern Art. Baccarat Hotel New York is home to the only Spa de La Mer in North America. Baccarat Hotel New York is home to the world’s first Spa de La Mer. Parisian art connoisseur, Frédéric Chambre spent eighteen months gathering extraordinary pieces from auction houses across Paris to curate artwork for Baccarat. Beyond this exceptional artwork, Baccarat Hotel also partnered with the talented curator to commission new work from eleven extraordinary artists. Each artist or team of artists was given 10 Baccarat Harcourt glasses — one of the most iconic pieces of the brand’s stemware — and asked to create works of art based on them. These radiant pieces now stand on display in dramatically lit glass vitrines in the hotel’s hallways, one unique artwork in front of every guestroom or suite. 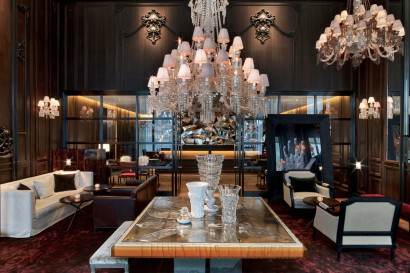 There are 15,000 Baccarat crystal glasses for guests to enjoy and 17 handmade crystal chandeliers. In guest rooms, on the telephone handset, a button marked “Champagne” will allow guests to order a bottle of their favorite vintage to their rooms accompanied by signature Baccarat fluted glasses (in select suites). • Each of the hotel’s 114 guest rooms and suites feels like a private pied-à-terre. Room categories start with the generous Classic King and ascend to the Baccarat Presidential Suite, the hotel’s “pièce de résistance.” All rooms feature floor-to-ceiling windows, sitting areas, and custom jacquard linens by Mascioni. Hidden from the sleeping area by hand-painted French doors, white marble bathrooms boast glass-enclosed showers with oversized shower heads and exclusive amenities created for the hotel by Parisian perfumer Francis Kurkdjian. All of the non-alcoholic beverages from our custom mini bars are complimentary for all guests as is wifi access. 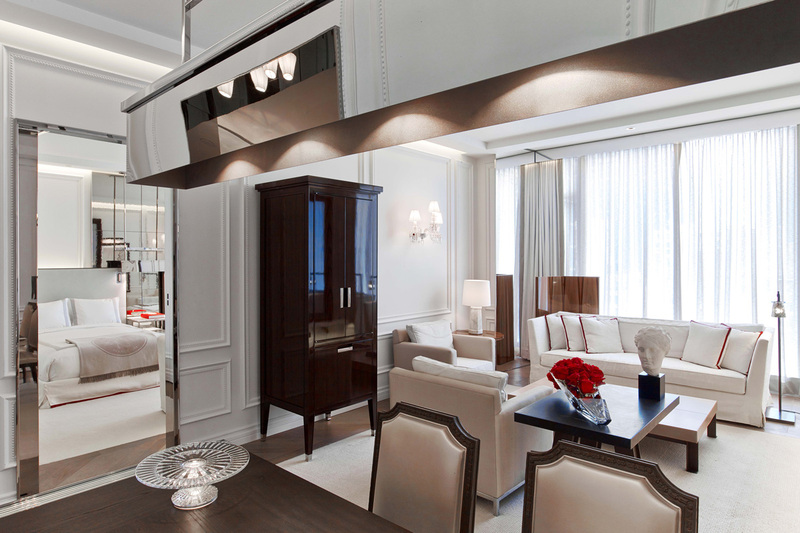 The televisions are artfully hidden and ensconced behind the mirrors in each living room and guestroom. A tablet equipped with state-of-the-art technology will control all aspects of the room, including temperature, lighting, and room service. 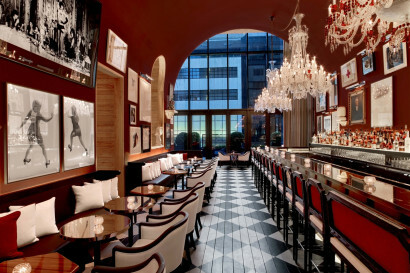 A custom-designed Baccarat red enamel mini bar will offer delights from the French gourmet house Fauchon. 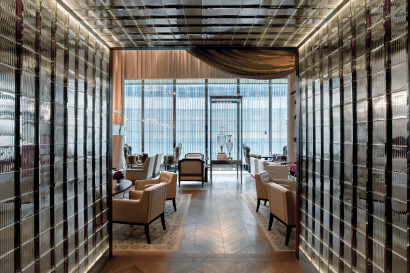 Baccarat features the first Spa de La Mer in the world offering their reknowned ‘miracle serum’ and sought after skin treatments. The luxury fitness center, complete with Woodway Treadmills, offers guests a stunning environment to remain fit 24 hours daily. 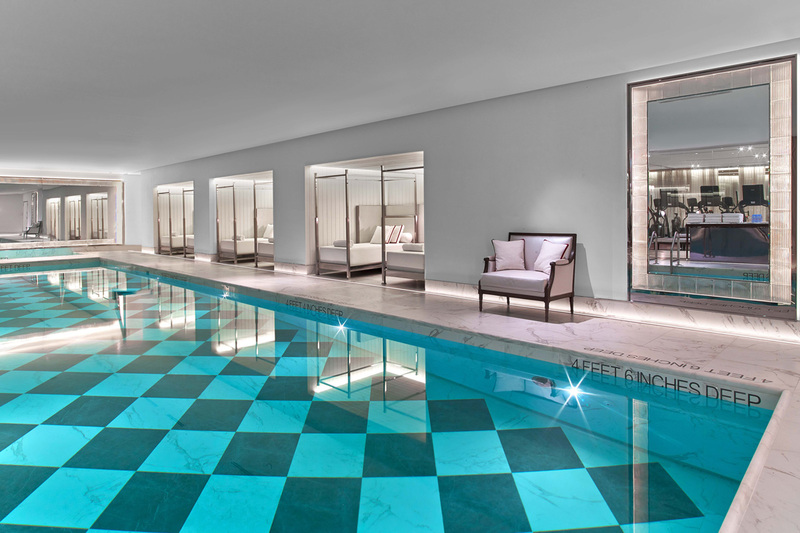 The 5 square meter indoor marble swimming pool is available to all guests. 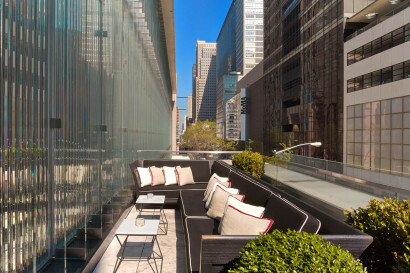 This relaxing environs is surrounded by luxurious day beds that were inspired by the Cote d’Azur. 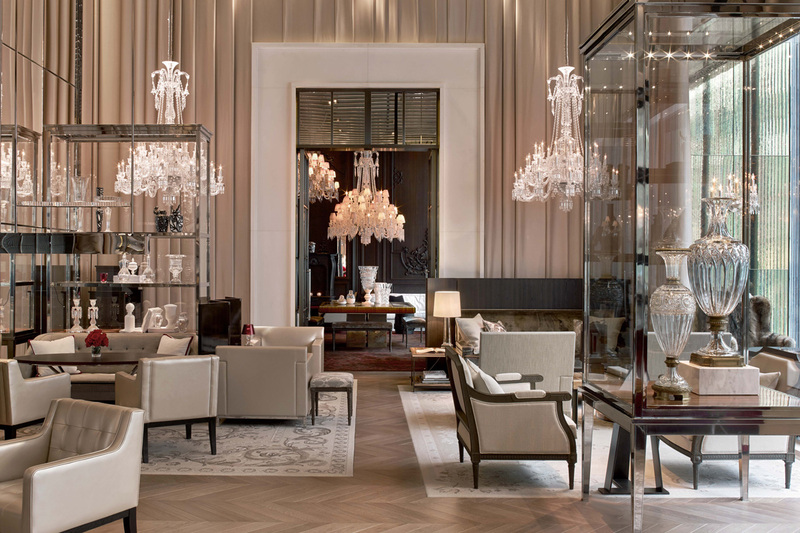 Named after one of Baccarat’s most iconic pieces, the Harmonie Room gives guests the sense that they are surrounded by a piece of the legendary maison’s perfectly crafted crystal creations. 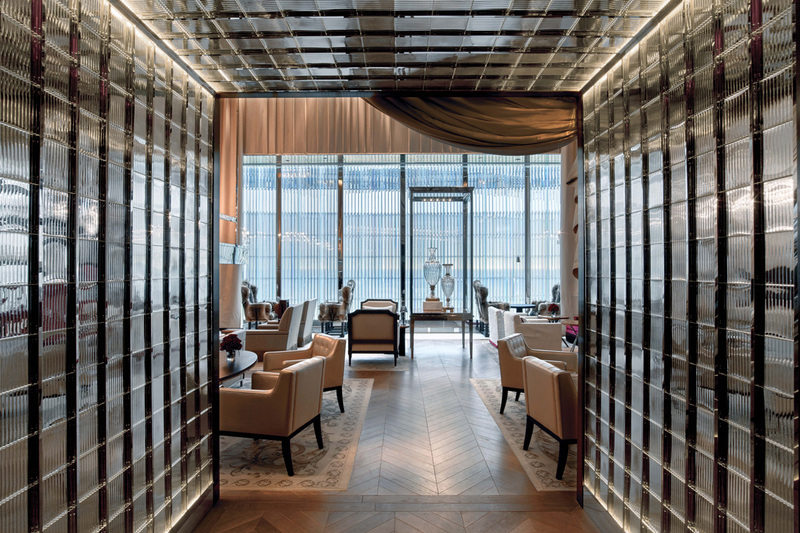 Custom French molding and a prismatic wall of glass line the 800-square-foot space, gently reflecting and refracting light from Baccarat sconces and the illuminated city outside. Overlooking the Museum of Modern Art, the salon-style Harmonie Room can accommodate 40 guests for fully serviced celebrations and gatherings, both personal and professional, daytime or evening. 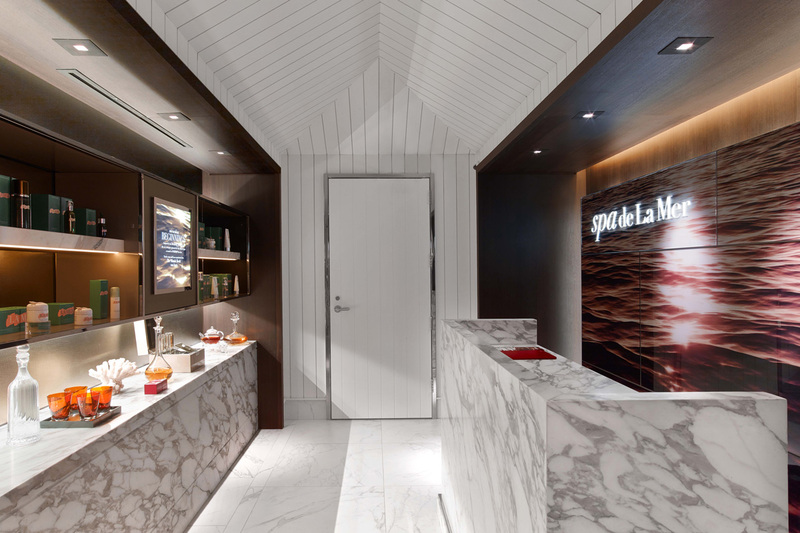 Beyond the room’s beauty, its state-of-the-art technology and discreetly designed service amenities enable effortless experiences. Featuring a projection screen, blackout drapes, two flat-screen televisions and high-speed WiFi, the space can accommodate a variety of configurations and seating arrangements. A private buffet room can be accessed separately, so that meetings and conversations can continue even as lunch or coffee service begins.